This beautiful rosary depicts Saint Damien & Saint Marianne on the handcrafted center medallion. 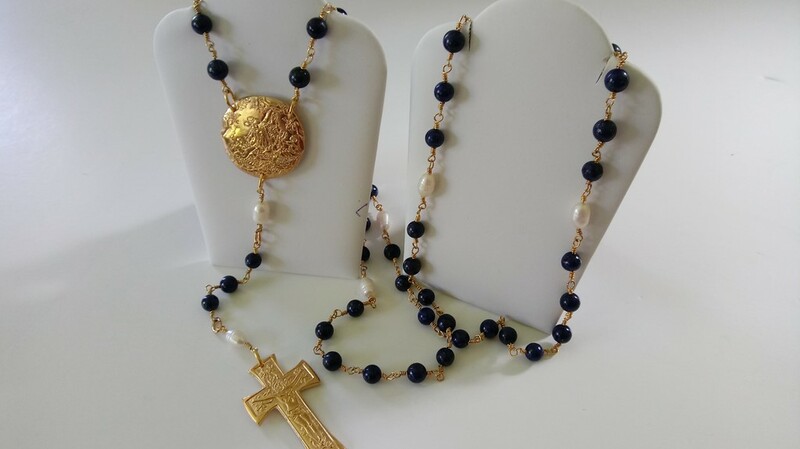 An absolute incredible rosary made with Genuine Blue Lapis beads. We custom designed this rosary as a special gift by us for Bishop Larry Silva of Honolulu, Hawaii. It was presented to him at the first Saint Damien Conference in Honolulu in Hawaii October 2017. We choose genuine Lapis for his rosary as blue is Bishop's Silva's favorite color. We are so happy for him loving his special rosary and would welcome the oportunity to create one for you, too. All our rosaries are available in 925 Sterling Silver, 24K Gold Vermeil ( 24K Gold over Sterling Silver ) and 14K Gold. This is a stunning handmade Rosary that will be a keepsake in your family. The complete rosary is hancrafted, including each link between the natural blue jasper beads. The Saint Marianne Rosary features a cross with a Kukui Design that is beautiful but also has special meaning. The Kukui is the State flower of Hawaii and symbolizes "Light and Truth" , a perfect match for this georgous rosary. 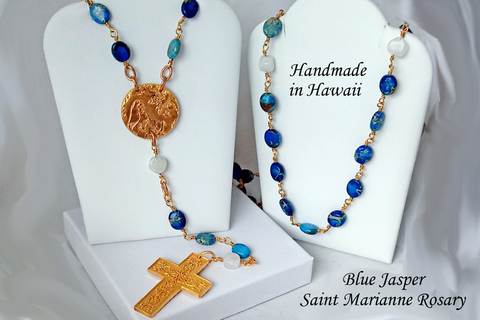 Our Rosaries are made right here in Volcano, one at a time, and custom requests are always welcome. This rosary is made with genuine gemstones. Blue Jasper and white quartz are a georgous combination and you will definately get lots of compliments on this rosary. Special black velvet 7"x7" keepsake folder included, so your rosary always has a safe place during your travels. Available in 925 Sterling Silver, 24K Gold Vermeil, or 14K Gold. 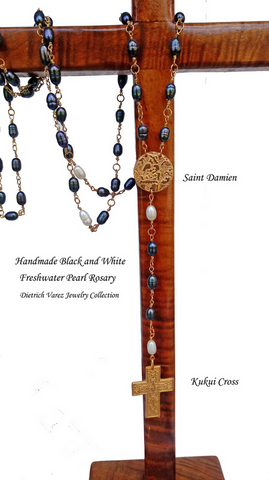 Avaialble in 925 Sterling Silver or Vermeil ( 24K Gold over Sterling Silver ), an absolute georgous Saint Damien Rosary. The Saint Damien medallion, the custom Kukui Cross, and all the links inbetween the Pearls are all handmade, one at a time. Each link is wire-wrapped. There are 5 sections with 10 ea. BLACK frewater pearls, separated by 1 ea. WHITE freshwater pearl. Made to Order - Please allow at least 2 weeks for shipping. We welcome custom requests.